At what sites can it be used in adult and paediatric patients? 3. Describe how you would perform the procedure shown below and how you would confirm correct placement. Which drugs and fluids cannot be administered by this route? List the indications and contraindications for using this device. 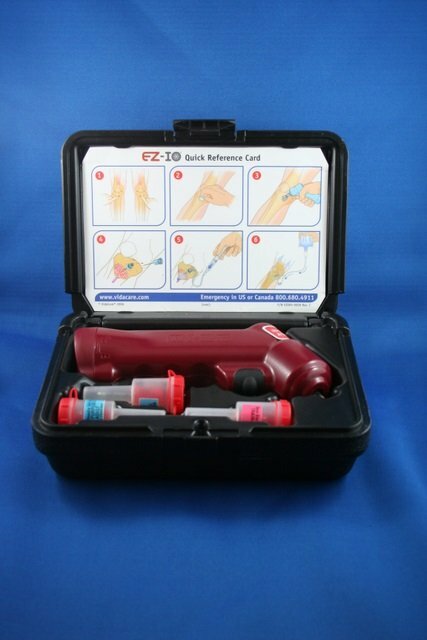 The device is the EZ-IO intraosseous infusion system (M ayo Health Care ). It is a battery powered medical drill intended for the controlled insertion of an intraosseus needle. The most common sites are the proximal tibia and distal femur. These sites are used in both adult and paediatric patients since the optimal position can be easily identified and the bones are near the skin. Additionally, intraosseous access is safe at these points due to an absence of local blood vessels and nerves. Other possible sites include the pelvis, at the anterior inferior iliac spine, or the distal tibia, just above either the medial or lateral malleolus. In adult patients, the proximal humerus can be accessed, but only by using a battery powered drill. The sternum is not a suitable site and access at this site has been associated with death. Once the most suitable injection site is selected, it is cleaned using aseptic solution and local anaesthetic infiltrated into the skin, subcutaneous tissue and periosteum. The chosen site of insertion is stabilised, for example, the knee and thigh are stabilised, if the proximal tibia is to be accessed. In the aforementioned case, the insertion point is the anteromedial surface of the tibia, just below and medial to the tibial tuberosity. The needle is directed at a slightly off perpendicular angle to the bone surface (some 10-15 degrees) to prevent the needle sliding along the bone. Pressure is applied in a slightly rotary motion, although if using a manual technique, considerable force will be required to pierce the bony cortex. Once the cortex is pierced, a ‘give’ will be felt, indicating penetration of the marrow cavity. Once the cap of the needle and stylet is removed, an attempt to confirm the correct position by aspiration of bone marrow is made. Sometimes, despite correct placement, bone marrow cannot be aspirated. However, correct placement can firstly be assured by the ability of the needle to stand unsupported and secondly the needle flushes freely with saline without resistance or increase in circumference or firmness of the surrounding soft tissues. The needle is then secured with a bulky gauze dressing and tape, prior to connection to a normal intravenous fluid line. Unlike the endotracheal route, any fluid or drug can be administered via the intraosseous route, including catecholamine boluses and infusions, sodium bicarbonate, calcium, colloids, blood products and TPN. Intraosseous access is recommended for emergency circulatory access when it is difficult or time-consuming to obtain either peripheral or central venous access. The latest version of the joint Australian and New Zealand Resuscitation Guidelines, published in December 2010, recommend early intraosseous access if intravenous access is not available, in preference to administration of drugs via the endotracheal tube. There are few contraindications to intraosseous access. All contraindications are relative, since intraosseous techniques are only used in an emergency. They include: fracture in the intended bone; damage to the blood vessels draining the intended site (e.g. complicated fracture proximal to the intended site of insertion); local cellulitis, burns or infections at the intended intraosseous site.